Google just delivered what we've waited for. A comprehensive redesign of the Android operating system designed for your ride. And unlike the handful of automakers that Apple has on board for CarPlay, Google is boasting over 40 automaker partners at launch, with the first cars hitting showrooms this year. The basis for Android Auto is simple: Plug in your phone and an auto-friendly interface is mirrored on your car's display. Everything is run off your Android smartphone, delivering a clean, simple interface, and the primary input – as it should be – is voice. "It looks and feels like it's part of your car," says Patrick Brady, director of engineering at Android. "But it's running on your phone." The functionality to start includes voice-controlled navigation, Google Music streaming integration, and messaging that lets you respond to text messages without taking your hands off the wheel. 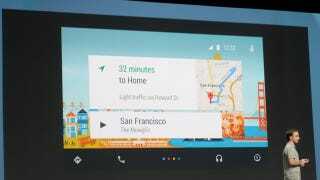 There's going to be deep integration with Google Now for contextual information delivered when it's relevant. It looks slick as hell, and the software development kit for devs will be out later this year. But what's more impressive than the functionality is the partners. Acura, Alfa, Audi, Bentley Chevy, Chrysler, Dodge, Fiat, Ford, Honda, Hyundai, Infiniti, Jeep, Kia, Maserati, Mazda, Mitsubishi, Nissan, Opel, Ram, Renault, Seat, Subaru, Volkswagen, and Volvo are all on board. So there's a good chance your next ride will be Android Auto compatible. BMW, Porsche, Toyota, and Mercedes are the notable exceptions, but considering some commitments to Apple's CarPlay, we're not entirely surprised. More details to follow once we get our mitts on a demo.